About 6700 cubic inches. Roughly 15"x14"x32 WxHxL. 1300 g/ 2.8lbs. Removable internal compression strap. Burly, padded grab handles at the ends. 10 low profile attachment points for the shoulder strap or to lash the duffel onto something. 1000d Cordura Webbing combines a soft hand and incredible strength on the handles and shoulder strap. US made #10 water resistant zipper. 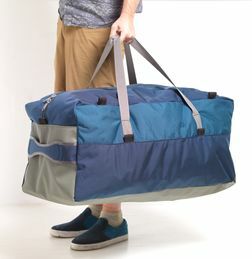 The large duffel will take any CiloGear WorkSack with the lid on it. This is a full expedition sized duffel. It's the largest size we could make a bag that wouldn't be automatically oversized for international flights.